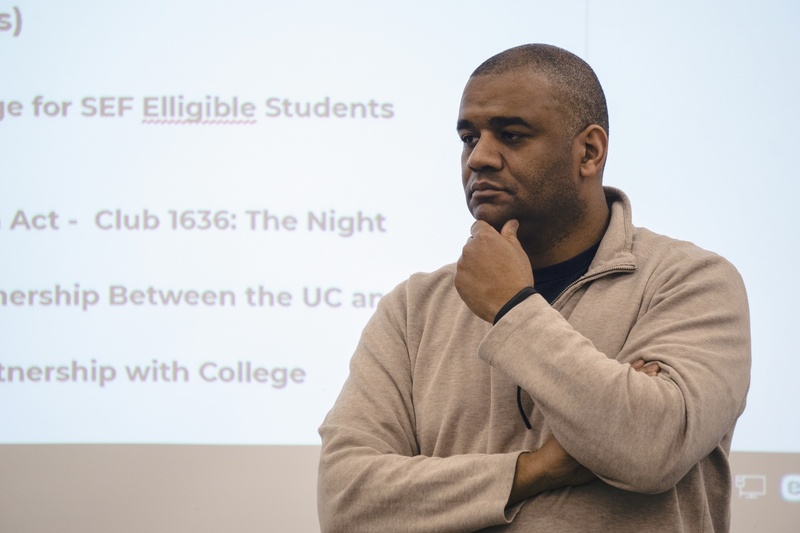 Associate Dean of Students for Diversity and Inclusion Roland S. Davis at the April 15 Undergraduate Council meeting. Associate Dean of Students for Diversity and Inclusion Roland S. Davis said Sunday that Harvard’s Office of General Counsel and Massachusetts Hall—traditionally a name for the University’s central administration—are “involved” in examining the Friday arrest of a black Harvard undergraduate. Davis—who gave this update at a weekly meeting of the Undergraduate Council—said he is unsure whether or not “decisions have been made” with regard “to any kind of a formal investigation” of the incident. OGC comprises Harvard’s internal arm of lawyers who help legally represent the University. University spokespeople could not immediately be reached for comment late Sunday evening. But eyewitnesses of the event—including members of the Harvard Black Law Students Association—have stated CPD’s version of events is “incorrect” and have called the incident an instance of police brutality. “While on the ground, at least one officer repeatedly punched the student in his torso as he screamed for help,” the BLSA statement reads. The CPD police report detailing the arrest states one officer involved in the incident punched the student at least five times while the student remained on the ground in an attempt to unpin his arms and handcuff the undergraduate. The student was ultimately charged on several counts including indecent exposure, disorderly conduct, and assault. BLSA’s statement argues other Harvard resources—not CPD—should have been contacted and mobilized to come to the student’s aid before CPD got involved. 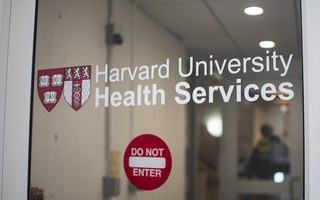 In particular, the statement states Harvard University Health Services were contacted first, but that HUHS transferred the callers to CPD. “I’ve been trying to get an answer to that and I don’t have an answer to that right now, so read between the lines,” he said. Davis encouraged UC members to put pressure on Harvard’s administration to demand an answer to that question. He told representatives they should “keep that a present and burning issue” before administrators. Quincy House Representative Sarah Fellman ’18 asked Davis whether there will be a meeting between students and representatives from HUHS and CPD. Davis said he does not yet know the “specifics” surrounding a potential meeting, but noted that administrators including Dean of the College Rakesh Khurana and Dean of Students Katherine G. O’Dair have been “in meetings all day” to discuss the issue. “When we know, then we’ll let people know,” he said. 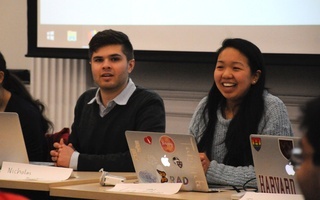 Ivy Yard Representative Swathi R. Srinivasan ’21 also questioned Davis about the College’s amnesty policy and how “it kind of fell apart” during the Friday incident. “I hope to hell it’s being looked at,” Davis said when asked why the amnesty policy was not applied during the Friday incident involving the student. “Salma [Abdelrahman ’19] and I and a junior at the College, Hilda Jordan [’19], are organizing some kind of body that’s trying to be a response and advocacy kind of body,” Whittaker said. Whittaker said he and others involved with this organizing effort are currently “fundamentally focused” on helping and protecting the student involved in the arrest. 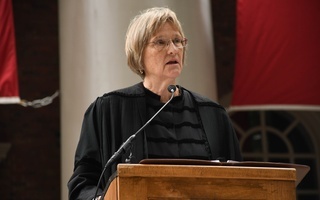 In the days following the Friday incident, hundreds of Harvard affiliates gathered in meetings across campus to discuss the arrest, share concerns, and plan a response. Abdelrahman detailed steps she hopes the UC will take in response to the incident. She said she thinks the Council should issue a “statement of support and solidarity with black students” at Harvard and also with the arrested student. Abdelrahman also said the UC should hold a public meeting with the heads of HUHS and HUPD. Dunster House Representative Victor Agbafe ’19 asked Davis whether administrators are holding discussions with CPD and HUPD in the wake of the arrest about what constitutes “correct protocol” during an “escalating situation” like Friday’s incident. Zhang said she and Council Vice President Nicholas D. Boucher ’19 want to work with HUPD, CPD, HUHS, administrators, and different “affected communities” going forward. Asked Sunday whether Harvard as an entity can take a “stance” on the student’s arrest, Davis said he was unsure. —Staff writer Jonah S. Berger can be reached at jonah.berger@thecrimson.com. Follow him on Twitter @jonahberger98. 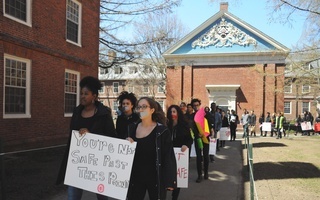 In the wake of the forcible arrest of a black Harvard undergraduate Friday, hundreds of University affiliates came together across campus to discuss the incident, share frustrations, and plan a response.